She got you a good one raptor! Ouch! Well thats a war story for you! I was so proud of mine and Judy is only a meter. I will never be able to mention my bite again after reading your story. Plus was so quick she just wacked and over; i never even realised what happened until i saw the blood. 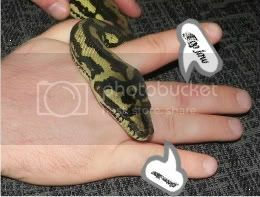 Having her hold on must be scary as you have no idea how long before she realises the mistake and lets go; if at all. The advice to keep alcohol in the first aid box to pour around the mouth to cause her to let go does not help when you in the clutch of a 6 foot plus snake and the box is in the next room. Hope you toasted her with a good whisky. Had to go for my B12 injection today and the nurse insisted I have the injection in the arm that was not bitten in case it's venomous...I tried to tell her...I really did. We went from " have they had their fangs out" to " the poison must really hurt when they squeeze you"...I was trying so hard not to laugh. 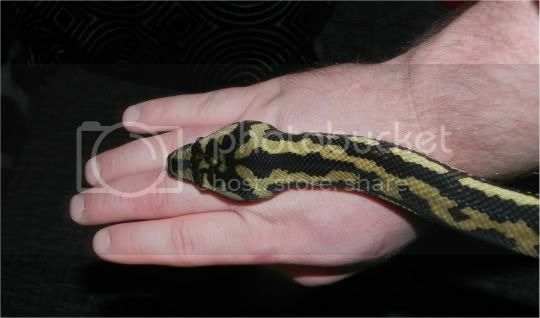 In truth there isn't much to see now, just some small holes and a nice bruise on the knuckle ( that snake has long teeth! ). I'm hoping no teeth broke off too! This is where she got me...Not much to see now though. But considering her head size I still got off lightly. 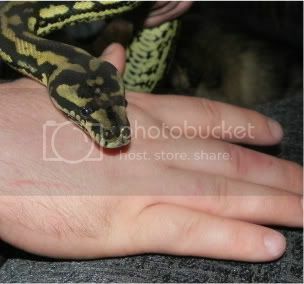 I had to open my mouth and last nite my lavender retic got me on the hand! !